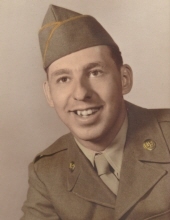 Burns, Harold E. Sr. of Southfield passed away at home on November 30, 2018 . He was born in Barrie, Ontario, Canada on June 25, 1927 to the late Ewart and Ada Burns. Loving husband of Nancy Burns (nee Hale) for 63 years. Dear father of Harold E. Burns Jr. of Madison Heights, Marsha Lawrence of Southfield, Eric Burns of Madison Heights, Jennifer (Michael) Cragg of Austin, Texas and Stephen Burns of Austin, Texas. Caring grandfather of 3 and great grandfather of 6. Brother of Larry (Bernadette), Jack (Gail), Ross (Elizabeth), late Ron (surviving wife, Beth), and late Bobby. He will be dearly missed by many nieces, nephews, relatives and friends. Memorial services will be held at a later date. To send flowers or a remembrance gift to the family of Harold E. Burns, please visit our Tribute Store. "Email Address" would like to share the life celebration of Harold E. Burns. Click on the "link" to go to share a favorite memory or leave a condolence message for the family.